Beware of New Twitter Spam - "Bad blog going around about you"
This is not first time I have received spam messages from Twitter. Just now I checked my twitter account and what I see is two Direct Message saying “Bad blog going around about you, have you read it yet?” followed by a URL shortened with twitter shortener. 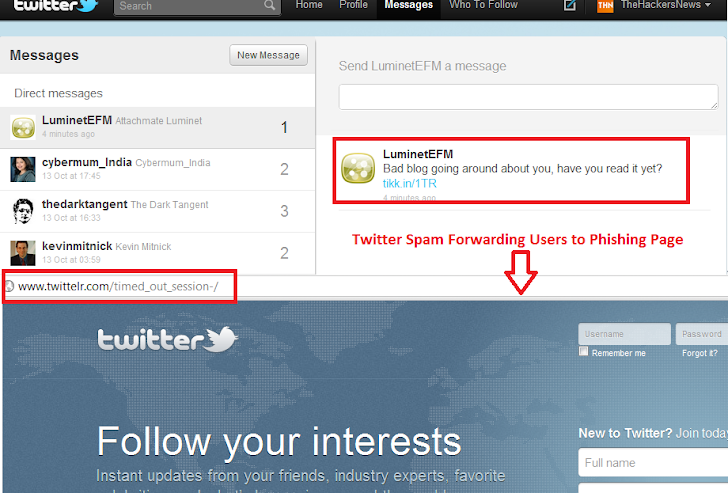 I just Visit That Link and Found that, its a Phishing Page of twitter. Its Looks almost 99% Similar to Original Twitter Login page. I am sure that 70% of people who receiving this spam may get confused and will fall in trap of spammer by providing their Login details on phishing page. Please be aware about this New Spam on Twitter.